Jenine Married Shaun in Waterford Castle. James and I first met through a mutual friend over six years ago. Over the course of the first year of getting to know each other we both realised that we had feelings for each other that were more than just friendship. Our first official date as a couple was in a restaurant called Fat Freddy’s. We went there as we both love good food and knew they had a good reputation which was a plus. The date was both scary and exciting at first but as we both relaxed it started to feel normal and we started laughing and joking with each other which we have carried on doing since then. We had talked about getting married on numerous occasions in the early days and these were just conversations we had lying on the couch together in front of the TV but neither of us ever actually said the words. So when we were staying with family in Donegal in July 2013 and while down at a beautiful beach in Dunfanghy I realised just how much I wanted to spend the rest of my life with Aiden. Completely unplanned I asked him then and there ‘Will you Marry me?’ Thankfully after the initial shock of me asking him wore off he said ‘Yes’. At first we wanted a small intimate wedding but as we were drawing up the guest list we knew this wouldn’t be possible! So we decided we would have a small intimate ceremony and have all our friends and extended family join us after for the reception. We had been to numerous weddings where the food and service was terrible so that was a number one priority to us. We had been to a wedding in The Lodge at Ashford Castle before and we both loved the venue, the staff and most of all the great food so it was our first hotel to check out for our big day. After our first meeting with Mairead the wedding coordinator we didn’t go anywhere else. The whole package in The Lodge at Ashford Castle is just amazing, great food, amazing views, beautiful rooms (all our parents are still talking about the size of their suites) and the friendly staff made it the only place we wanted to have our wedding in. We both knew exactly who we wanted to stand up there with us so we ended up having six bridesmaids, three of our closest friends and family each. We had an idea of what colour we wanted for our suits at first but when we picked the Bridesmaids’ dresses which we got from Tracy Bridal in Galway we knew the colour we wanted for the suits wouldn’t work with the dresses so we had to go back to the drawing board which was good because we found the perfect suits for our big day in Corless Formal Wear also in Galway. The run up to the wedding was exciting but also stressful at times and without Mairead’s help with the planning we probably would have given up. She did so much for us in the lead up to and on the day. She was with us from morning right through the whole day, everything we needed, from glasses for photos down to setting up the sweet table, she took care of it. She really is a credit to The Lodge at Ashford Castle.All the staff on the day really did their best to help us and Elaine Biggins looked after us so well at the top table on the day. She was amazing especially when Aiden’s niece Kayla decided she wanted to sit between us half way through the meal. Elaine made some very special trips to the kitchen for black pudding for her!! Gina also helped so much organising rooms and getting people in at the last minute. We had been to a wedding in The Lodge at Ashford Castle before and we both loved the venue, the staff and most of all, the great food. The wedding day and venue were just perfect from start to finish. The hotel was amazing with everything from setting up the room for the ceremony to changing it around again for the reception. We laughed and smiled the whole day as we had nothing to worry about and after speaking to our friends they had nothing but good things to say about The Lodge at Ashford Castle and staff. We really wouldn’t change anything about the reception, except maybe bring more people to experience the amazing day. 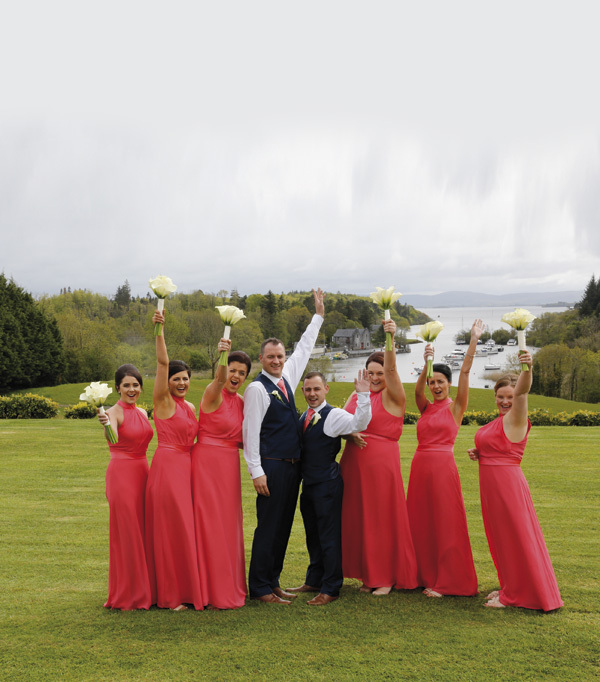 We were also so pleased to be allowed onto the grounds of Ashford Castle with our photographer Gerry O’Gorman to take some amazing photos to go with the amazing memories we have from the day. We went on honeymoon to Nashville, Philadelphia, New York and Chicago for three weeks in total. We went four weeks after the wedding which gave us the time to let the whirlwind of the last few weeks sink in properly and it was really nice to just chill out and enjoy it all.